YES! YOU CAN REMOVE SCRATCHES FROM ACRYLIC! Micro-Mesh Finishing Cloth is Available in Rolls. 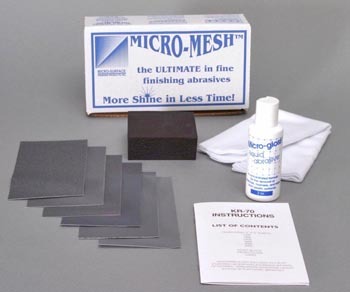 Micro-Mesh is made with a flexible cloth backing. cutting together on the same plane with a positive rake. NOTE: Kits for both hand and mechanical application methods are available. Removes swirls & scratches created by improper cleaning methods. Removes haze and milkiness from interior / exterior windows. Provides a final polish, leaving you with an ultra-clear finish. Can be applied by hand or mechanically. Approved for use by Boeing, Spec. D6-52021. 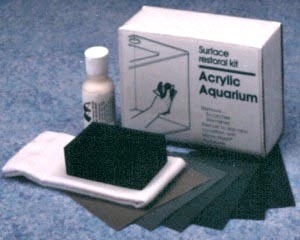 Removes scuffs and surface scratches from small acrylic acquariums. This hand kit will restore up to 20 square feet. For large aquariums we recommend our mechanical kits or larger hand acrylic kits. Replacements for the small abrasive pads found in Dupont's Corian Care Kit. These pads are 3 times larger. 1 - 4000AO BLUE/12000AO GREY. 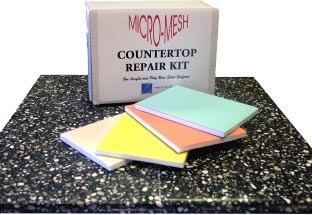 Instructions clearly explain how this kit will remove stains, burn marks, scratches and scuffs to any solid surface countertop or sink. This kit will allow you to match any surface from matte to high gloss. 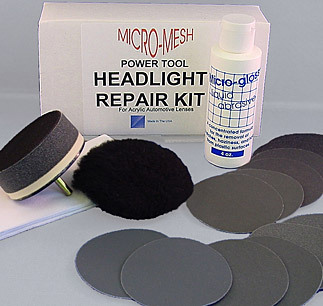 Return your headlights to "Like New" Condition, improving illumination and appearance. This system includes applicator pad for use with hand held electric drills. Drivers and passengers alike need and appreciate the clear view that well maintained headlights provide. Comfort, enjoyment, but more importantly - SAFETY, are all requirements today! The smallest of scratches can lead to crazing. By keeping headlights smooth and optically clear, through regular maintenance, crazing can be avoided.